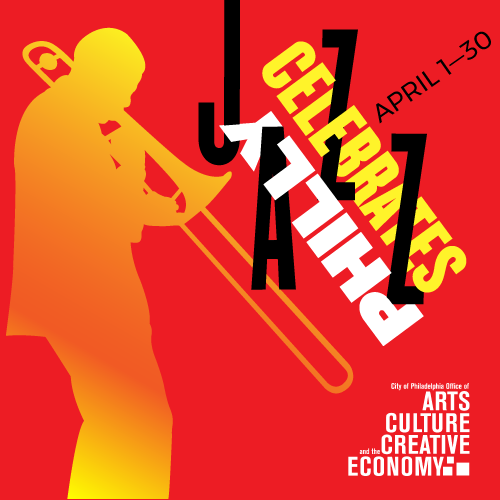 Celebrate jazz and the city’s vibrant music culture all April long with Philly Celebrates Jazz, led by The Office of Arts, Culture and the Creative Economy (OACCE)! Philly Celebrates Jazz is a part of Jazz Appreciation Month in Philadelphia which aims to draw more public attention to the iconic tradition of jazz. Alongside the 200+ jazz events happening every day this month, OACCE and Art in City Hall will be debuting two brand new art exhibitions: The Philly Celebrates Jazz Listening Lounge and Reflections. The Listening Lounge transforms the Art Gallery at City Hall into an interactive experience with music, books, art, photography and more. Reflections, on the second floor of City Hall, will highlight the work of six artists reflecting on how jazz and jazz culture has inspired their work. Returning this year is Philly Celebrates Jazz Neighborhood Series, which includes special film screenings, dance lessons, jazz performances and more. This year's celebration will also include the brand new initiative Philly Celebrates Jazz 2019 Photo Session Contest, a partnership between OACCE, Philadelphia Jazz Project, and All About Jazz / Jazz Near You to cover costs of professional photos for ten up and coming local jazz musicians. Philly Celebrates Jazz will kick off with an opening reception and awards ceremony (this year's Benny Goldson Award will be presented to Kevin Eubanks) on Thursday, March 28 and will run until International Jazz Day, Tuesday, April 30. For more information, including a full calendar of events, visit OACCE's official website for Philly Celebrates Jazz. Jazz Appreciation Month in Philadelphia is a project of the Smithsonian Institution’s National Museum of American History and this year marks the 19th anniversary of the national celebration. Want to know when your favorite performing and visual art events are 1/2-price? Then sign up for our weekly Funsavers email! Jump into spring with Subaru's Cherry Blossom Festival in Philly!